Open to the public on weekdays between 17th June – 18th July between 9am and 5pm. An excellent oppertunity to meet our MArch and BArch students, this years industry night Private View is on Thursday 16th between 6 and 9 pm. 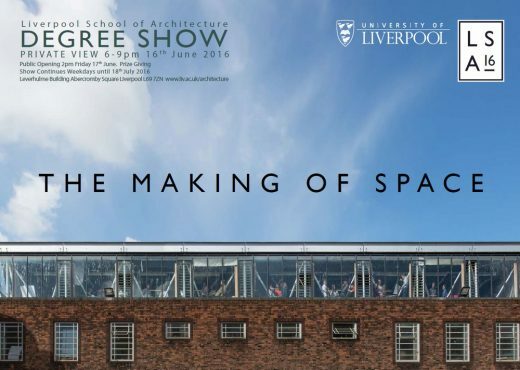 Our degree show launch and prize giving this year takes place on Friday 17th June at 2pm. The LSA degree show is open to the public on weekdays between 17th June – 18th July between 9am and 5pm. If you have any enquiries or would like to attend the Private View, please contact Michael Longworth or Sandy Britton. Our degree show launch and prize giving is this year due to take place on Friday 17th June at 2pm. All events take place at the Liverpool School of Architecture. We are located in Abercromby Square, opposite the University Sports Centre. Road, rail, coach, air and ferry directions are also available on the university visitors web page.